Podcast - Stand and Deliver! So anyway, here's the podcast. If episode one has a title, I reckon it should be 'Knew Amsterdam'. There's a whole other meta-thing going on with the musical accompaniment that I'll blog about later - but tell you what: if you can list all the tracks and explain their significance, you'll win a brief cessation of my perpetual disdain. Ben Kochan, a tweep I follow, tweets me to say that Jim Jefferies and Eddie Ifft mentioned me in their podcast, Jim & Eddie TalkS hit. “That would excite me,” he says. “Maybe it excites you”. I go straight to their podcast homepage to access their latest episode, no. 133. It features Nick Thune. I begin listening. I begin to get worried when they start talking about fat people. Well, not when they start. When they get to the bit about ‘fat people who don’t see themselves as fat’. I’m pretty sure that’s not me, I’m just hoping I don‘t fit into (so to speak) that category without knowing it. I don’t want to be talked about on their podcast in that context. Even though, truth be told, I’m not that way about my weight. I’m aware of it. However, I am that way about my age. I’m an old person with no idea how old I actually am, or appear. There are people younger than me who seem so much older than me. Mostly because they do grown up things like work hard, earn good money, own houses, drive cars, have kids, submit their Business Activity Statements on time, that sort of thing. There are one or two other moments where the podcast goes to places I hope don’t actually involve me. Towards the end, Nick mentions he’s coming to Australia in August. I’m guessing, in the last 30 seconds, they’re going to suggest he lets me interview him for this blog. Nope. That doesn’t happen. That’s not it. And the episode’s over. I go to iTunes to look at other recent episodes. I see Orny Adams was their guest in the previous episode. And I shudder. See, I interviewed Orny Adams way back in 2006. Back when I was producing a podcast – a groundbreaking podcast called Radio Ha Ha, dissecting comedy with comedians much as all the great podcasts do now. And not necessarily doing it any better than anyone does it now. But in a time when practically nobody was podcasting, it was important and groundbreaking. We had an awesome conversation, Orny ’n’ me. It went for ages, we covered so much ground, we got on brilliantly. And then, when it was over, I realised I’d stuffed something up technically, and hadn’t actually secured a recording I could use. That hurt. Not long after, I interviewed Eddie Ifft for the first time. I was aware of, and overcame, the technical difficulty early in that interiew, cause I was being extra careful so as not to repeat the heartbreak of an excellent conversation resulting in nothing. Once, with Orny, was all the times I ever wanted it to happen in my life. So seeing that Orny was the guest of Episode 132, I knew then and there precisely how I was going to feature in Jim & Eddie TalkS hit. Here is an excerpt, and transcript of the relevant part. EDDIE IFFT: I do an interview in Australia, when I was there a long time ago. I’m doing my run through and, you know, you go do your series of interviews before the festival… I’m going to all these interviews. I go to this guy, and he interviews me: Dom Romeo. He’s the nicest guy in the world. JIM JEFFERIES: That was the first interview I ever had in my whole career. EDDIE IFFT: He interviews me for like two hours, and he’s such a good guy, and we had had some technical problems that he fixed. And he goes, ‘thanks man; I just interviewed Orny Adams a couple of months ago – I interviewed him for two hours and then found out that the recorder didn’t work. ORNY ADAMS: Yeah, yeah, so the whole thing sounded like… [makes unintelligible whispering sound] I’m pouring my heart out… Why do you think I’m not trying today? Done! So, if you’re interested, here’s the very first interview Jim Jefferies ever did with anyone. Here’s the last one I did with him. Here’s an interview with Eddie Ifft from a couple of years ago (not the Radio Ha Ha one). There is no interview with Orny Adams for me to direct you to. Okay, so I’m quite happy at the moment – my enhanced comedy podcast - Stand & Deliver! 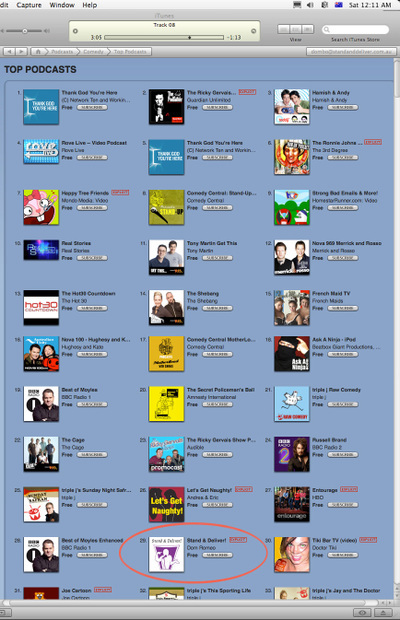 - currently sits at number 29 in the iTunes top 100 comedy podcasts. Subscribe via iTunes and find out! Pretty soon I'm going to burst through my bandwidth. If anyone would like to get on board before that time and buy some advertising, convince a rich and powerful friend to sponsor the show or just donate wads of cash, I'd be ever-so-grateful (you'd only be contributing to the greater good of the Australian comedy scene, after all). Meanwhile, please feel free to friend me at my MySpace space and Stand & Deliver!’sSpace as well, if you haven’t already.